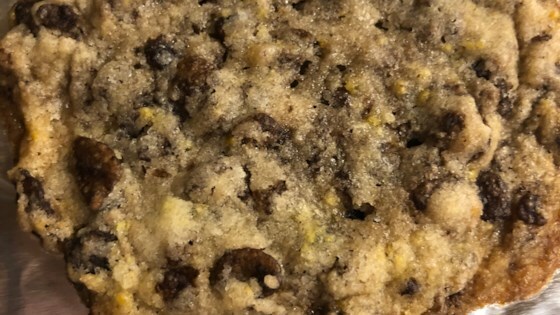 "Here is a good recipe for chocolate chip cookies with crisp rice cereal cookies." Preheat oven to 350 degrees F (175 degrees C). Lightly coat baking sheets with non-stick cooking spray. Cream the butter with the sugar until light and fluffy. Beat in the egg and vanilla until well combined. Mix in the flour mixture. Stir in the cereal and chocolate chips. Drop by level tablespoons onto the prepared baking sheets. Bake at 350 degrees F (175 degrees C) for 12 minutes or until lightly browned. Remove immediately from baking sheets and cool on wire racks. Store in an airtight container. EXCELLENT--I'm not sure why the others thought the dough was dry--I followed the recipe exactly, and the dough was perfect. The cookies are outstanding! Really nice cookie, had to take recipe to work for fellow workers. Its a keeper. They bake up really nice looking and I didn't have any trouble with the mixture, really fast and easy. It tastes and smells pretty good. I would say this cookie is a kid's type of cookie. Love this recipe will make it again. Great taste. These are great, My dough did not seem dry and I followed the directions to a tee. I did the mixing with my kitchen aid. I made a batch with M&Ms also. I would make these again.